It was a gorgeous day to DJ a wedding in Coloma on Lake Michigan.. The weather was perfect and there was also a light breeze. The sun was out and we were located right on the beach. I already knew that Tony and Lisa’s wedding reception would be stellar because I had the chance to talk with them before the big day. When you book with Encore we give you an online planner. This way you can login to the website and plan every detail months before the celebration. Their reception was held @ Pottawattamie Resort in Coloma Michigan. Since it was outside we were under a tent and provided some lighting for their wedding including a custom name light. We were even able to do a custom canopy wash to make it change colors. 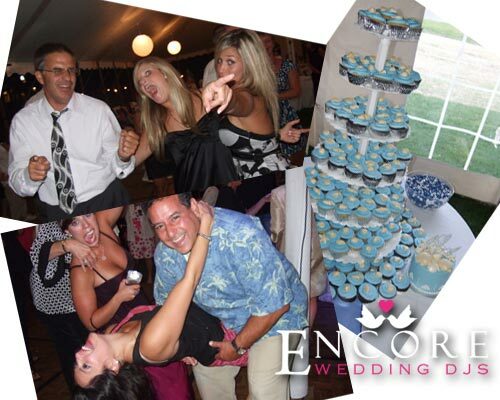 Tony and Lisa used cupcakes stacked on different sized tiers for their cake and the food was phenomenal. Towards the end of the evening there was a firework show that set off over Lake Michigan. The clients were really big fans of Buck Cherry. I really don’t have to say much more about the song, I bet you have a good idea of which song I’m talking about : ) They mixed in Crazy Chic into the both the grand entrance and first dance. The first dance song really caught the guests by surprise. It started out with Keith Urban – Making Memories of Us, and then acted like the song messed up and in came Buck Cherry. I have to say that out of a majority of weddings that I have personally done, this by far is in my top three. The dance floor was PACKED the entire evening, we actually had people dancing on tables… literally! The only thing I could keep on thinking about was that at the end of this year, we will have a blog post with the best shots from the year and this wedding has a handful of pics that can compete with the hundreds of other events we have DJed in West Michigan. We even personalized their first dance which was Keith Urban Making Memories of Us with a quick 15 second clip of Buckcherry in it. Thanks Tony and Lisa for making us a part of your special day and Money Honey along with Buckcherry will never go out of style! Just as a quick update, the client actually purchased the venue they were married at and now they help others plan receptions at the same place they celebrate at.